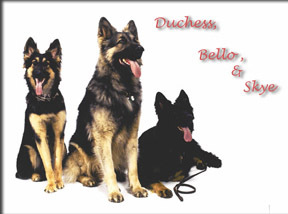 Our Shiloh Shepherds descend directly from multiple GV and NS lines. At Noble Acres our Shilohs are bred for quality, soundness, and distinction. 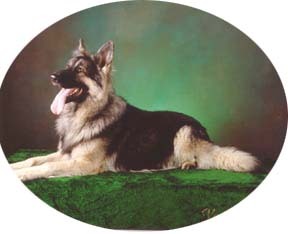 The Shiloh Shepherd is a calm, intelligent dog, who generally gets along with other animals. These big, friendly giants love nothing more than to be with their family members. Easily trained and very biddable, the Shiloh Shepherd makes an excellent SAR, herding, therapy, and companion animal. 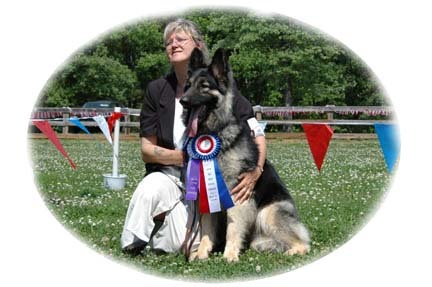 Shiloh Shepherds were first recognized by the American Rare Breed Association (ARBA) in 1991 . The breed standard calls for an impression of nobility and intelligence. Shilohs are protective without undo aggression, while still being sweet and loving to children and family. Females are typically 26 to 28 inches at the whither, while males are 28 to 31 inches. Females can weigh between 80 and 115 pounds while the males run between 115 and 140 at maturity. With his giant size the Shiloh is obviously not for everyone. The Shiloh needs lots of exercise, grooming, training, and socialization. Puppies can be energetic and rambunctious. Please feel free to contact us if you'd like more information about these wonderful dogs. Our Shilohs are our loving family members who live in our home, not a kennel. We proudly raise, train, and title our own dogs. Puppies are available occasionally to select homes. Our puppies are all health guaranteed. 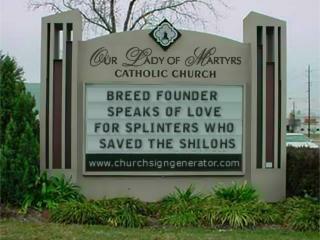 We do extensive genetic health testing on all of our Shilohs. Our Shiloh Shepherd puppies are temperament tested and microchipped before being placed in their new homes. Our puppy families are able to keep in touch with one another and us by joining our Noble Acres Yahoo Group. Each year, thanks to Jacki Wilde, we have a calendars of all our Shiloh Shepherd puppies in their new homes, which is available to their new families. Our 2004, 2005, 2006, 2007, 2008 , and 2009 calendars were fabulous. still have time to order yours. We also now have our own Noble Acres Store!! We unfortunately have to worry about puppy mills and unethical breeders in our beloved breed, too. Please check with the BBB before buying from any breeder. Bo wins Best in Show at the ISSR specialty!